On Saturday morning, October 15, the Twin Cities of Minnesota Wabash Service Day had seven Wabash men participating, with an addition of eight relatives and friends. This year’s service project was performed at the Liberty Plaza affordable housing development in St. Paul, MN. Liberty Plaza is a 173 unit, 100% Section 8 property owned by the 501 c3 non-profit Twin Cities Housing Development Corporation. In addition to US born residents, 11 other countries are represented in the resident population. In this property of approximately 500 residents, 265 are children. The average household has three people, and the average annual income is $14,343. 1.) In Plus Time room (gr. K-5) take everything out of cupboards, clean out cupboards and organize contents of cupboards. 2.) Organize and clean up storage closet in Community Room. 3.) Wipe down snack cupboards in Community Room. Throw away all open containers. 4.) Organize books on book shelves in Plus Time room by age (the white book shelves labeled K, 1st, 2nd, etc.). 5.) Take out contents from cabinets in Youth Voice room (gr. 6-9) and wipe down cabinets. Replace and organize items that were in cabinets. A little hot coffee, a little cold juice, treats and camaraderie made the project move along quickly while helping serve a low income community. A job well done. 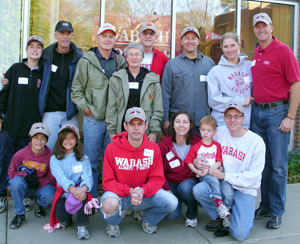 The 15 participants included: Charlie Crowley ’70 and his wife Mary; Kyle Falconbury ’96, with his wife Julie and son Ezra; Justin Killian ’03; Rich Most ’86; Bob Neal ’60 and his wife Barb; Adam Weliver ’93 and his girlfriend Chris; and John Wheeler ’70 with three of his children – Claire, Sam, and Jack. Yes, that is five decades of Wabash men coming together for WABASH Day.